The Orphan Barrel releases form Diageo have been coming under some fire, primarily for their marketing techniques. These bourbons have been promoted as lost or forgotten about stocks of whiskey, only recently discovered, and being released in limited quantities. The amount of bottles made available in waves, however, seems to defy the statement that these releases are limited. Additionally, the labeling has been a bit gimmicky, simply adding more fodder. All that aside (and I'm not looking to get on any soapboxes anyway), the one positive is that Diageo is releasing well-aged bourbons, and there is always a market for extra aged whiskey. 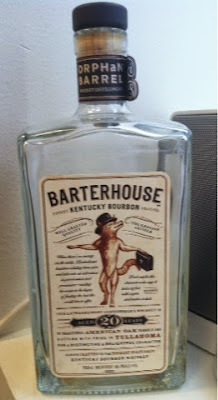 So, I gave Barterhouse a try. Before I get to the whiskey itself, I will note that this particular bottle was #70,817, and while I have not checked the numbering on each bottle, I continue to see this stuff on shelves. The bourbon itself is 90.2 proof. I do tend to favor the higher proof bourbons, but I was hoping that the age of the bourbon would add some complexity and character. On my first sip, the flavor up front was just okay. It's a dry whiskey, and I immediately noticed cloves and wood. What's interesting was the vanilla bomb that followed. It wasn't a sweet vanilla, like ice cream, but rather the flavor of unsweetened vanilla. It came on the back end of each swallow, but it came strong and lingered for a while. It was rich, yet not sweet. After the bottle was open a while, the wood flavors that I expected really came to the foreground. The clove spice seemed to transform to a hot pepper type spice, leaving an unsweetened-vanilla/oak/hot pepper combination which, unfortunately, did not blend well. They weren't exactly complementary flavors, and it just stuck out as an odd combination of flavors. Interestingly, though, I really loved the nose on this one. I could have sat on the couch all night just holding the glass under my nose and enjoying it. That will only get you so far, though. All in all, it's a drinkable whiskey, but one I'm not likely to go back for.